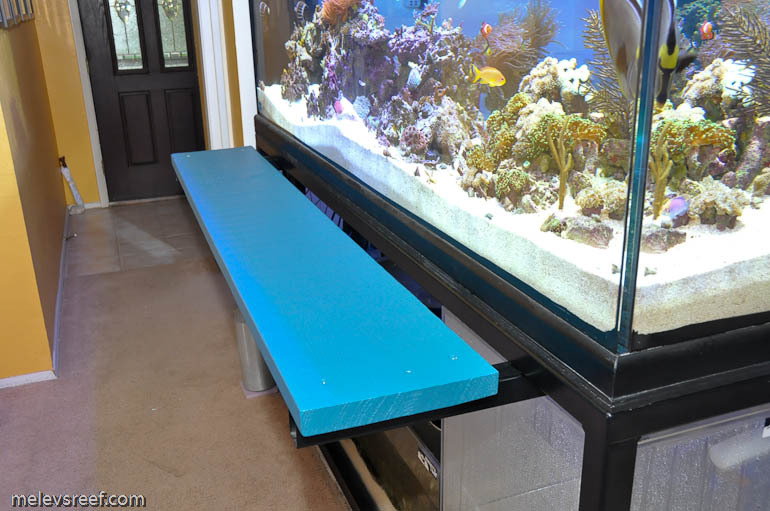 Tank: 400g Starphire Reef-ready with external overflow, custom-made by Marineland. It's 84" x 36" x 30" with double criss-crossed eurobracing. The viewing panes on three sides are Starphire glass. All four walls are 3/4" thick, the bottom panel is 1" thick with perimeter bracing for additional strength to avoid leaking. 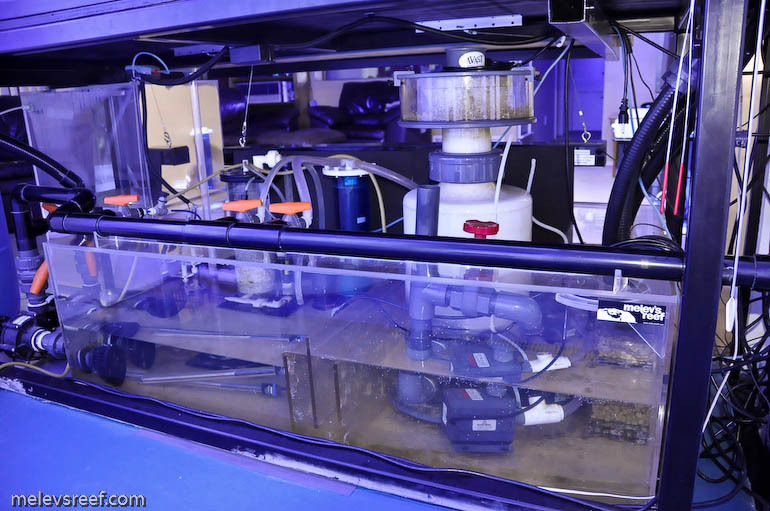 Sump & Refugium: 150g custom-made sump, made by Melev's Reef. It's 58" x 31.5" x 17" and runs about 80g during normal operation. 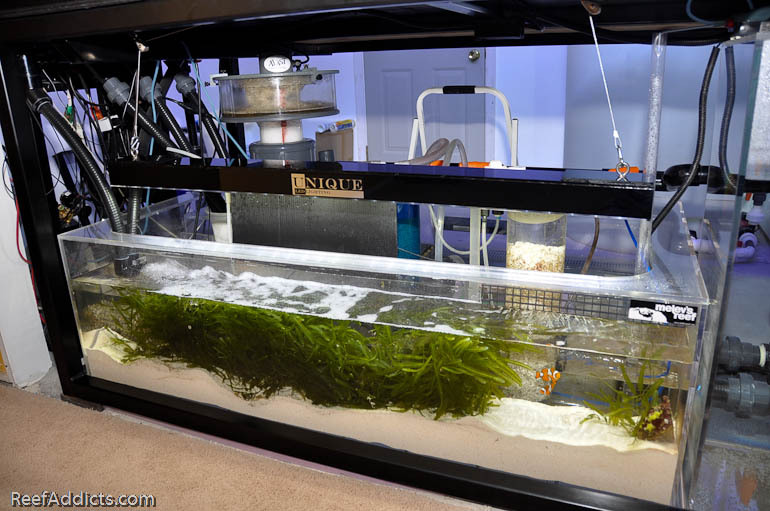 The refugium zone is the full length, 6" wide and the water level is 12" tall and is filled with sand and feather caulerpa. The sump is made of 3/8" cast acrylic. 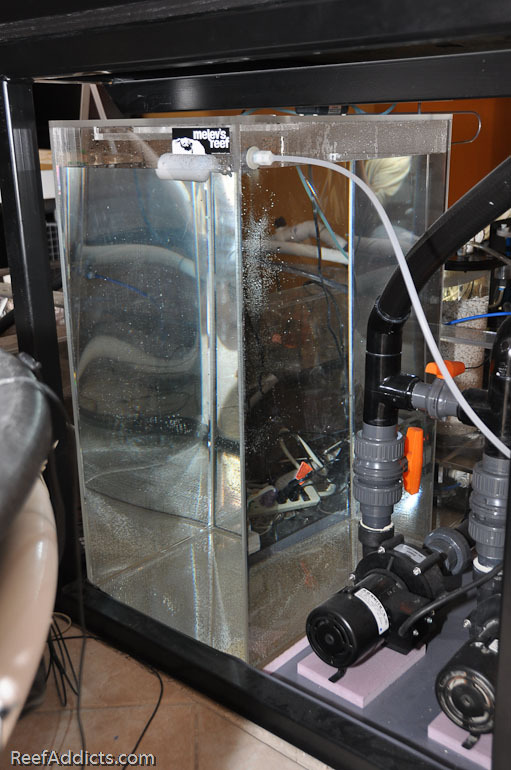 CO2 tank: (2) 5lb cylinders, using an electronic regulator & e-bubble counter, made by AquariumPlants provide the gas for the calcium reactor. 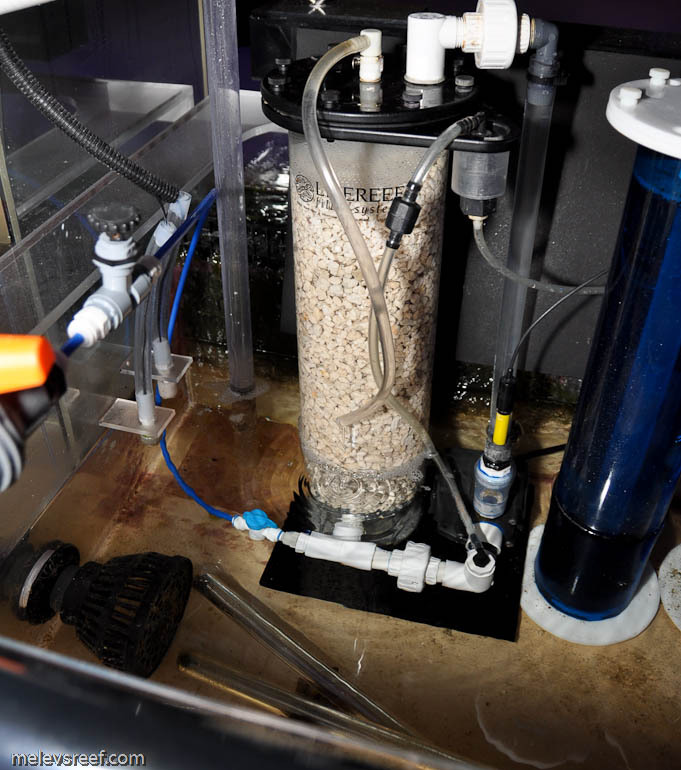 Dosing: Calcium and alkalinity are added via Calcium Reactor, and the Prodibio line is added to the tank twice monthly. Steel Stand: Custom built with walkboard, built by a local welder. The stand is made of 1/4" thick steel, 85.25" x 36" x 38" and powder coated. The walkboard is awesome, and I use it all the time. 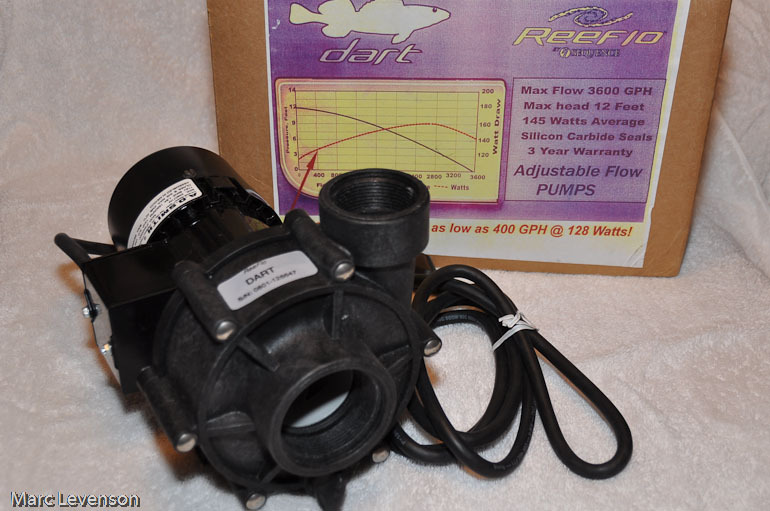 RO/DI system: 150gpd RO/DI system with booster pump, made by Melev's Reef. 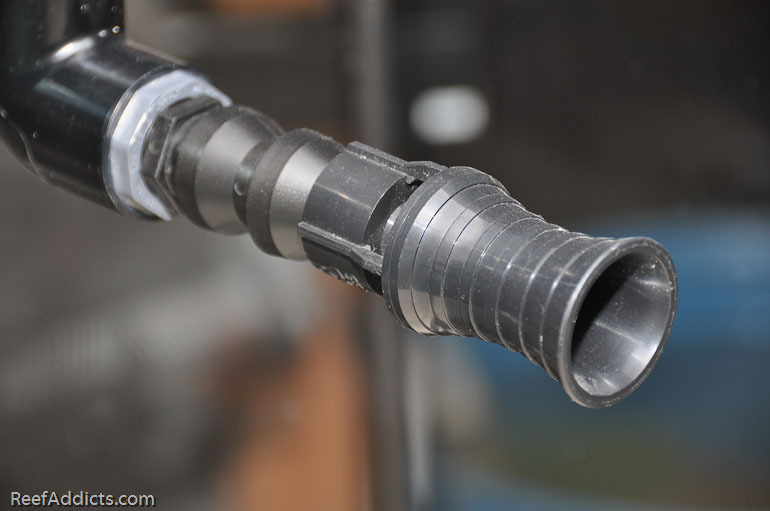 The booster pump keeps the unit running at 75 PSI. 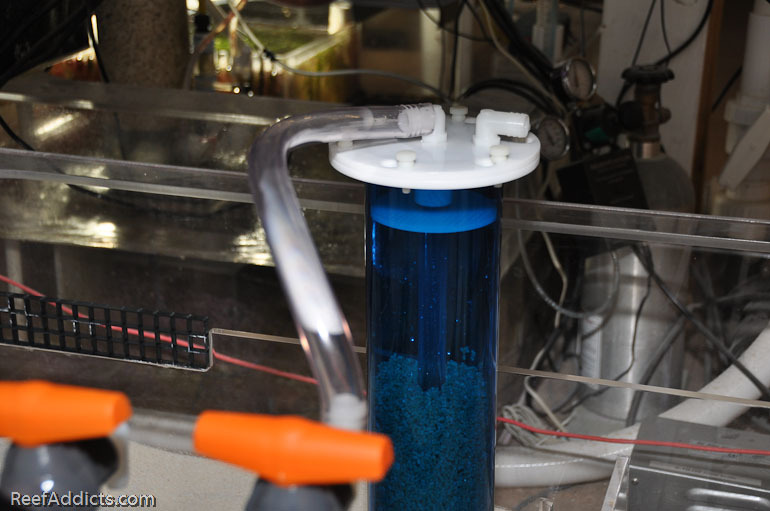 The tubing runs from the RO unit to the fishroom. With the twist of small inline ball valves, I can fill up the top off reservoir or the larger saltwater storage tank. Controller: Apex system with three power bars, made by Neptune Systems. It it connected to a UPS to provide power to the controller at all times, and is hard-wired to the router. I can receive emails or texts thanks to this configuration. The Apex App is handy to check on the tank as well as turn gear on or off as desired. The Apex is programmed for the lighting schedule, and powers the heaters and fans, primarily. Light Rack: Custom-made rolling light rack, parts from Ez-Tube and McMaster. All the lighting, ballasts and a Apex powerbar are mounted on the rack. It all moves as a unit. Lighting: (3) 400w 10,000K/20,000K TwinArc bulbs, 6' VHO URI Super Actinics, LED Icecap moonlighting, Reefbrite and Coralvue e-ballasts. The lighting period is staggered to mimic how the sun crosses the sky, and because I run TwinArc bulbs the color spectrum shifts from a 20,000K blue to 10,000K white daily. The moonlights are on from 10 p.m. to 11 p.m., thereafter the reef is dark for the livestock to rest. Refugium Lighting: Adjustable height 48" 6500 Kelvin LED fixture, made by UniqueLED Lighting. 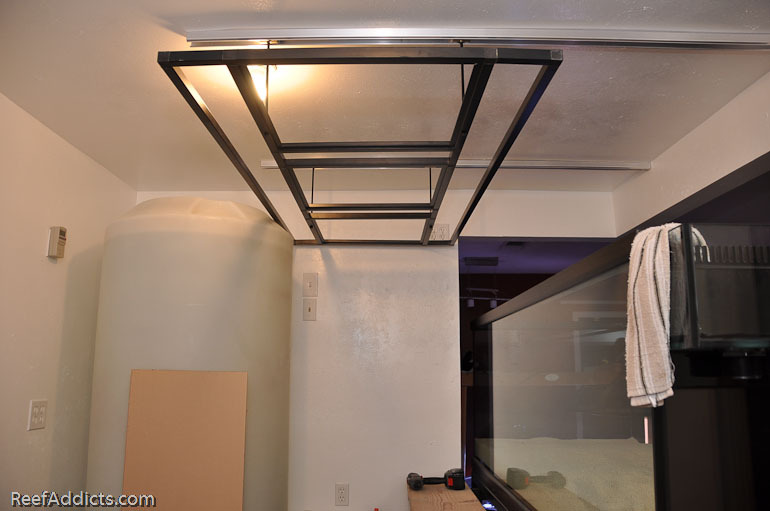 I don't move the lights position often, but have the ability to raise it up out of the way if I really need to access the refugium zone. 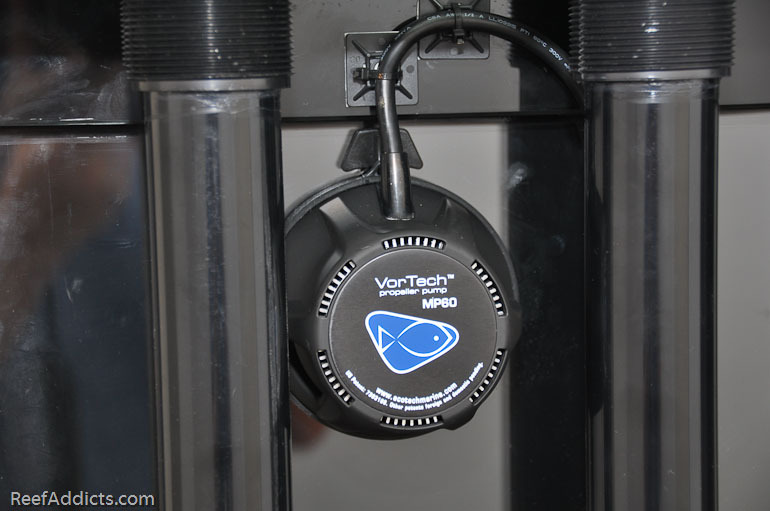 The light runs from 2:30 p.m. to 11:30 p.m.
In-tank Flow: (2) Mp60w ES Vortech pumps, (1) Mp40w ES Vortech pump; two 1" Penductors and that's it. The Vortechs run in Reefcrest mode around 60% flow. External pumps: (2) Sequence Dart pumps, from Reeflo Pumps. These pumps run quietly and move a lot of water. 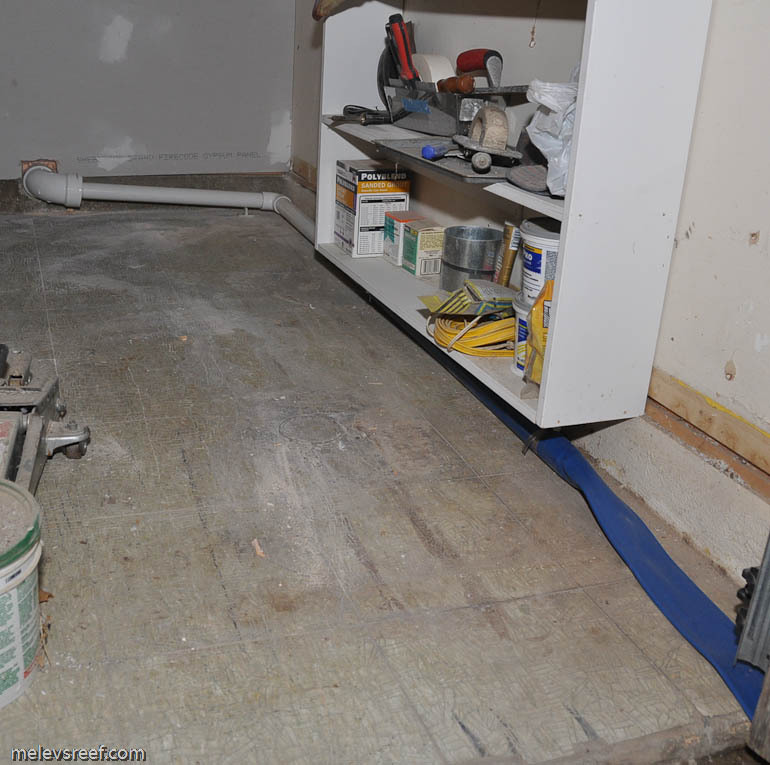 All Black Plumbing: Plumbed returns, drain lines, and manifold, parts from flexpvc and Savko. It probably costs three times as much as white PVC, but it looks great. Saltwater Storage: 265g poly tank with Coralife circulation pump, tank purchased locally. The tank is so large than I can't remove it from the room. I have to purchase salt that is bagged because there is only 9" of space above the tank to pour it in. Once a year I tilt the container on its side to clean it out with muriatic acid, then rinse it out well. Once clean, it's refllied with RO/DI water and salt. 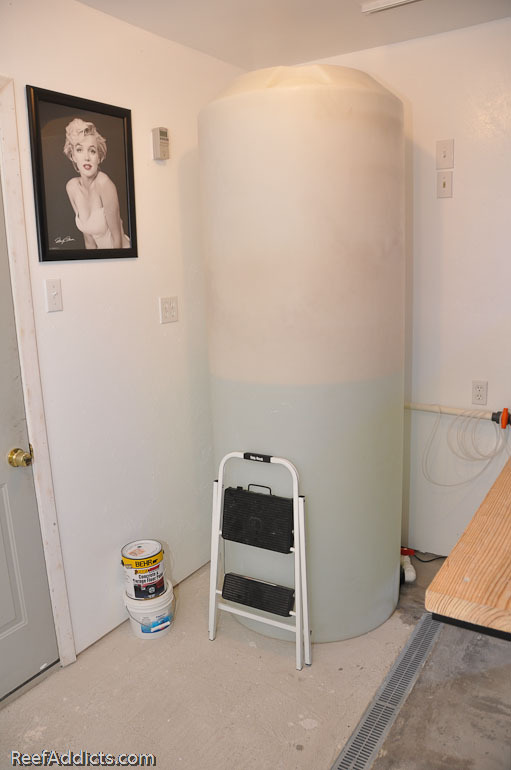 RO water storage: 45g ATO Reservoir, made by Melev's Reef. This container is made of 3/8" cast acrylic and is a sealed unit other than a single access door in case I have to adjust the float valve. It provides enough water to top off the reef for about 10 days before it has to be replenished. 22" x 15.5" x 33" fits exactly in the space I provided under the tank. The float valve shuts off flow from the RO unit so my floor never gets flooded, but once full I turn off the feed with an inline 1/4" ball valve so it won't add more water until I allow it again. 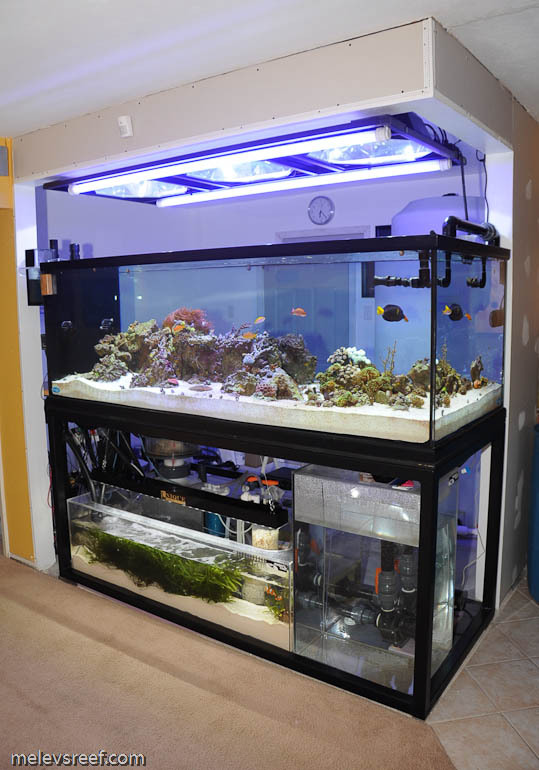 Top Off: Automatic top off for evaporation, SmartATO from Melev's Reef. Rather than having the Apex handle this, I prefer to keep parts separate to avoid the "all my eggs in a basket" scenario. Frag Tank: Frag System from Melev's Reef. The tank is 48" x 18" x 16" and holds 60g of water. 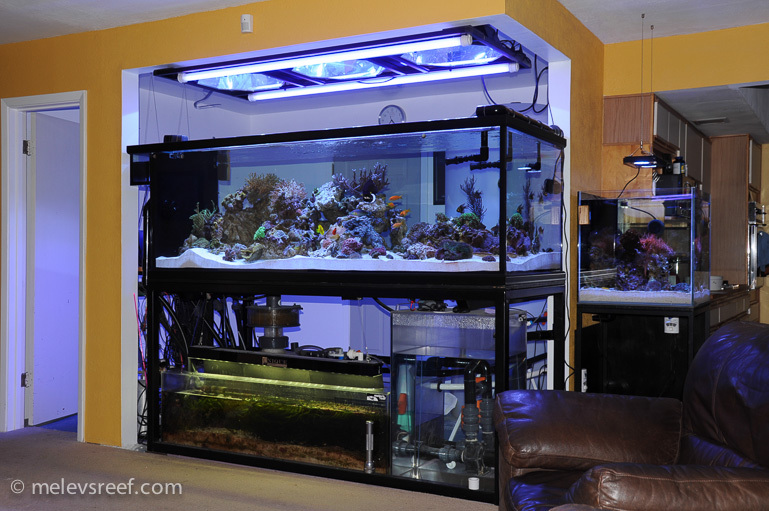 This is a self supporting system with its own sump, refugium, top off and triple dosing container. 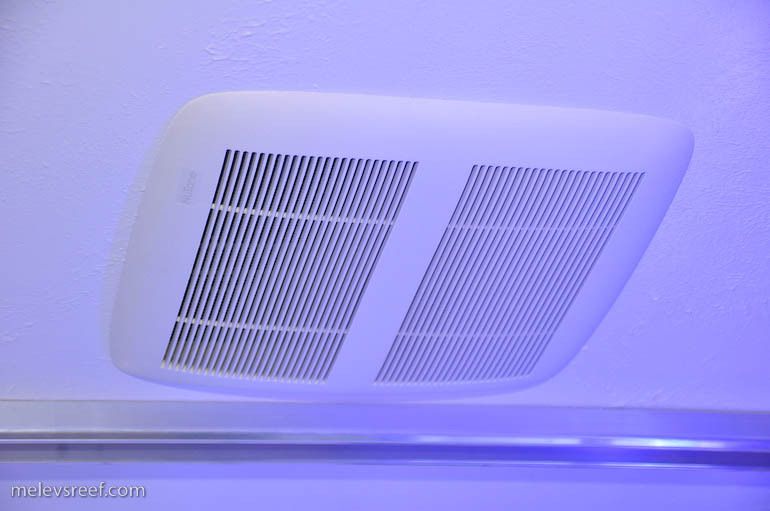 Ventilation: Ceiling vent fan exports moisture and heat out of the attic vent, and this has worked well for the past 10 years. The fan is "1 Sone" so it is dead silent. The higher that number, the noisier the vent fan. The cover grate is taken down for cleaning from time to time. Read this blog entry. Cooling: 120mm Icecap variable speed fan activated by the Apex as needed. It's an inexpensive way to keep the temperature of the reef in check, and no chiller is required. 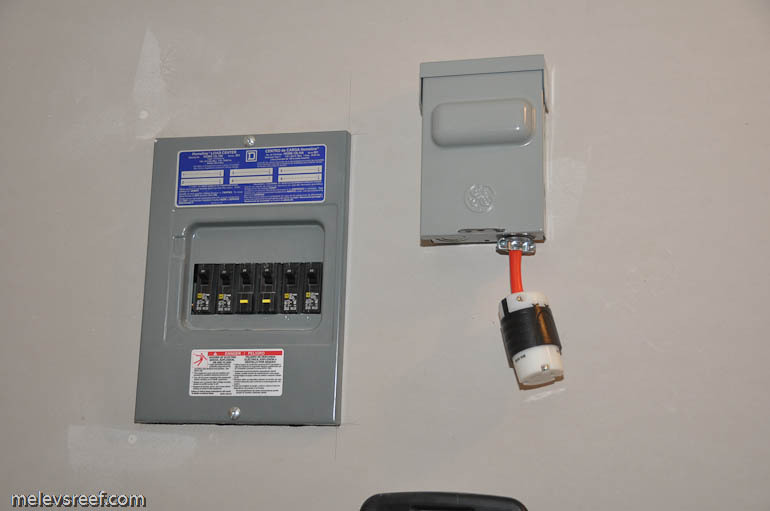 Electrical: 6 dedicated circuits to avoid nuisance trips in a subpanel, divided around the fishroom. Running everything divided across multiple circuits means no one circuit is overtaxed. For example, the portable A/C unit is on one circuit, the heaters on a different one, and the lighting on yet another. Power Station: Houses all the electronic components, includes the Apex, the pH controller, Vortech power supplies and drivers, and American DJ Switches and keeps everything nice and tidy. It's easy to turn items off or on when I need to do maintenance, or when I feed the reef. 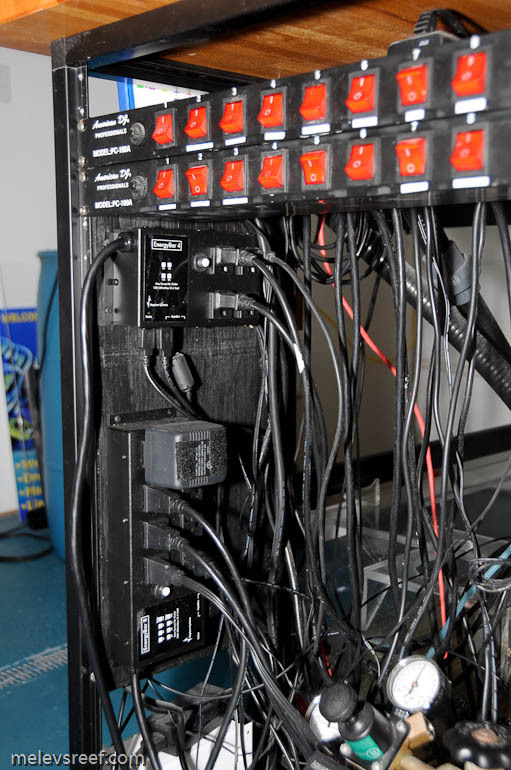 Backup: A UPS powers the Apex during an outage, and 6250w gasoline generator for extended black outs wired to sub panel. 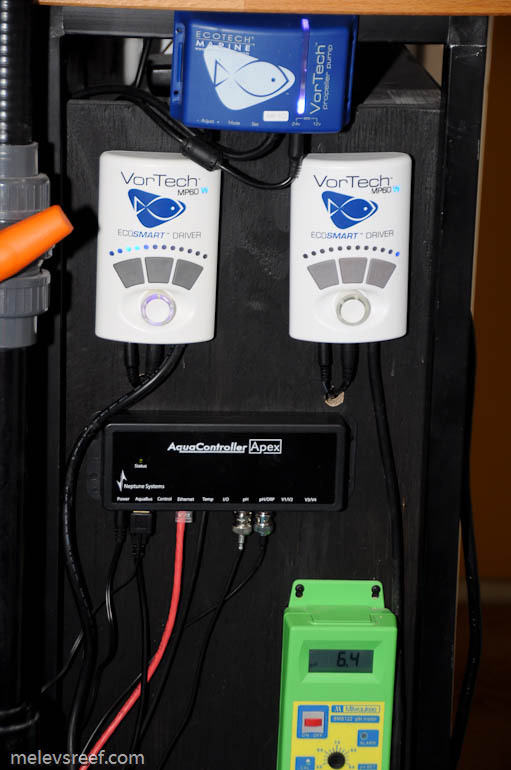 All the Vortech pumps are plugged into Ecotech Battery Backups that can power their pumps for up to 24 hours in a row. Access: The fishroom has two separate entry doors, the room is 12' x 9'. I poured the concrete floor of the fishroom myself. I can enter the fishroom from the garage or from the livingroom. I'm able to access the reef from all sides to work on it. 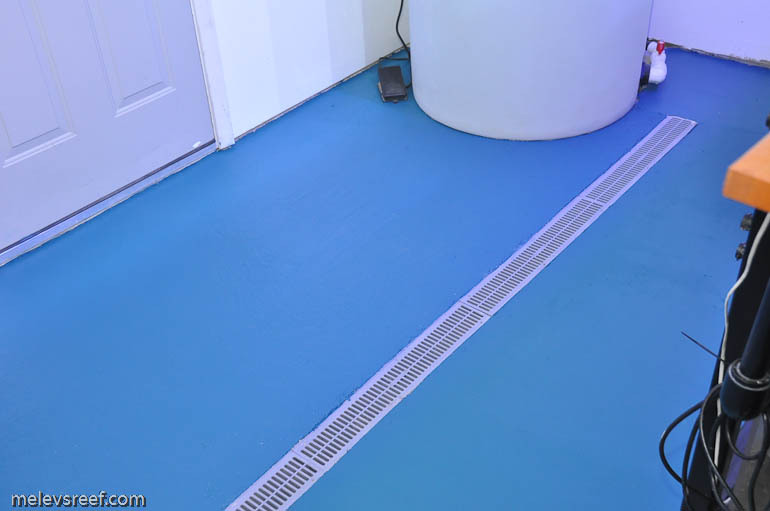 Floor Drain: A french drain runs the length of the room, plumbed with PVC to run any water under the garage door in an emergency. Best idea ever. Posted 3 days 2 hours ago.